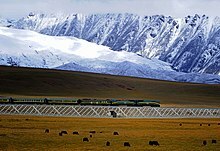 ^ The Tibetan Empire in Central Asia (Christopher Beckwith). [2009-02-19]. （原始内容存档于2011-08-07）. ^ Peregrine, Peter Neal & Melvin Ember, etc. Encyclopedia of Prehistory: East Asia and Oceania, Volume 3. Springer. 2001: 32. ISBN 978-0-306-46257-3. ^ Morris, Neil. North and East Asia. Heinemann-Raintree Library. 2007: 11. ISBN 978-1-4034-9898-4. ^ Webb, Andrew Alexander Gordon. Contractional and Extensional Tectonics During the India-Asia Collision. ProQuest LLC. 2007: 137. ISBN 978-0-549-50627-0. ^ Marston, Sallie A. and Paul L. Knox, Diana M. Liverman. World regions in global context: peoples, places, and environments. Prentice Hall. 2002: 430. ISBN 978-0-13-022484-2. ^ Zhang, X. L.; Ha, B. B.; Wang, S. J.; Chen, Z. J.; Ge, J. Y.; Long, H.; He, W.; Da, W.; Nian, X. M.; Yi, M. J.; Zhou, X. Y.; Zhang, P. Q.; Jin, Y. S.; Bar-Yosef, O.; Olsen, J. W.; Gao, X. 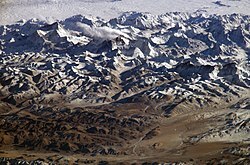 The earliest human occupation of the high-altitude Tibetan Plateau 40 thousand to 30 thousand years ago. Science. 2018-11-29, 362 (6418): 1049–1051. doi:10.1126/science.aat8824.